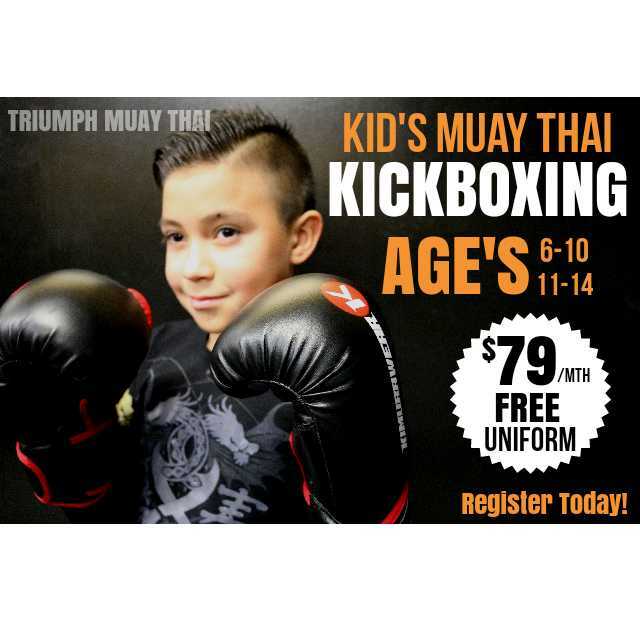 Our Jr. Muay Thai program is a great way to introduce your child to martial arts. Join us every Monday, Wednesday at 5:30PM, and Saturday at 12:30PM. November Student of The Month! Congratulations to Kristina for earning student of the month in November! She has made so much progress since joining our team! Keep it up! Congratulations to Gardela and Graciela for winning July student of the month. Keep up the good work! Congratulations to Brandon for winning April's student of the month. Keep up the good work and continue motivating the Triumph community! LE WIN! Congratulations to Rachel for winning February’s student of the month AND the 6-Week Weight Loss Challenge. Keep up the good work and continue motivating the Triumph community! Check out our 12 PM fitness classes Monday to Friday! Congratulations to Gino for earning student of the month for January! He came in for classes in the day and evening. Love the dedication! Congratulations to Cindy for earning student if the month in November! She earned her White Level and had a 70% attendance Rate! Keep it up Cindy! "J2 Hot4u" Get's The Win! Congratulations to Jefferson for winning his fight this past weekend at Destiny 5! Thank you to Milton Muay Thai for the opportunity, and Destiny Fights for putting on a great show! It's Time to Step up Your Game! Congratulations to Alfa for earning student of the month for June! She had over a 70% attendance rate! Camp Triumph was designed to create an awesome experience that your children are sure to enjoy. The week full of fun and exciting indoor and outdoor activities that are programmed not only to keep your child engaged but also to keep them active. This past weekend was the first Ontario Provincial Muay Thai Championship. We had a team of 4 representing Triumph, but unfortunately 3 of them could not get matched. Alec “The Ace” Shirley was the only one who was able to compete for the championship. He had 2 fights for the weekend. His first fight was against a much stronger opponent that didn't back down. Alec used various clinch techniques scoring some damaging knees to the body and elbow strikes to beat his opponent unanimously. In the Finals, Alec ended up fighting someone much fresher than he was. His opponent got a by in the first round into the finals. Alec approached the first round patiently looking for his shots, and Eventually found an opening which led to a liver kick that stunned his opponent back into the ropes. Shortly after, Alec delivered another kick to the liver putting his opponent away for good and earning GOLD in the 2017 Muay Thai Ontario Championship! Congratulations to Bonnie Ma for winning our 8 week weight loss challenge! Bonnie had an attendce rate of 70% and lost 10lbs! Time + Effort + Consistency = RESULTS! Congratulations to Melanie and Francina for having more then a 70% attendance rate for the month of January and February. Both earned student of the month awards! Keep up the good work girls! This past weekend marked our 1 Year Anniversary. We want to thank everyone who came out to support this historical day, and everyone who participated in our potluck. The food was great, but what made the night special where all our students, family, and friends coming together to celebrate our accomplishments, and appreciate the art of Muay Thai and it's culture. We are truly blessed with an amazing community here at Triumph! Big thank you goes to our DJ Paul Biaoco for the live music he provided, and all the students who participated in the Muay Thai demonstration. You all put on a great show! A special thank you goes to the one and only Ajahn Suchart for blessing our gym, and sharing powerful words and wisdom with all of us. 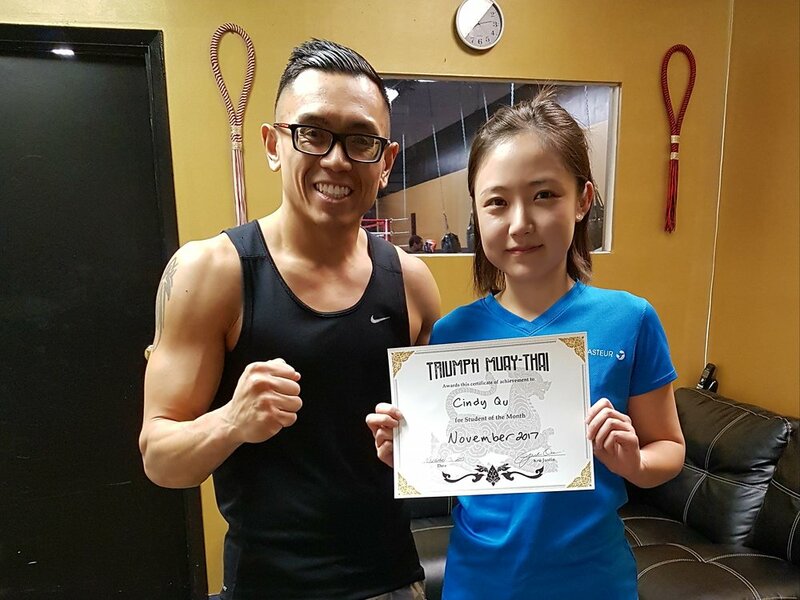 Thanks to the WKF and Saji Bolo for hosting an action packed event, and thank you to everyone who came out to support the Triumph Team! Congratulations to Toji "Knuckles" Nola for placing second. I know we didn't get the outcome we wanted, but you fought hard and finished strong! Time to move forward and focus on the WKF Worlds Championship! Congratulations to Ramuel "Ramboslice" Vilardo aka "The Ram" for showcasing his skills and winning the National Championship in dominant fashion! Thank you for all your sacrifice and hardwork you put in day after day! I am very proud of both you! Congratulations to our students who passed and earned their White Level!